Decorate your Halloween party in a fun and useful way with this cute Halloween pumpkin to sit on your table and hold your party necessities. This Plastic canvas pattern can be used as a Silverware holder or as a napkin holder at your party. 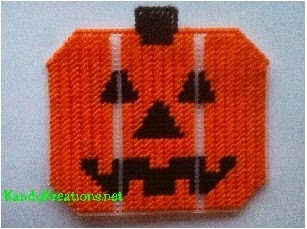 Try this quick plastic canvas sew that will make a lot of WOW at your Halloween party. I'm working on getting a few of my final projects done for our Halloween party next week. 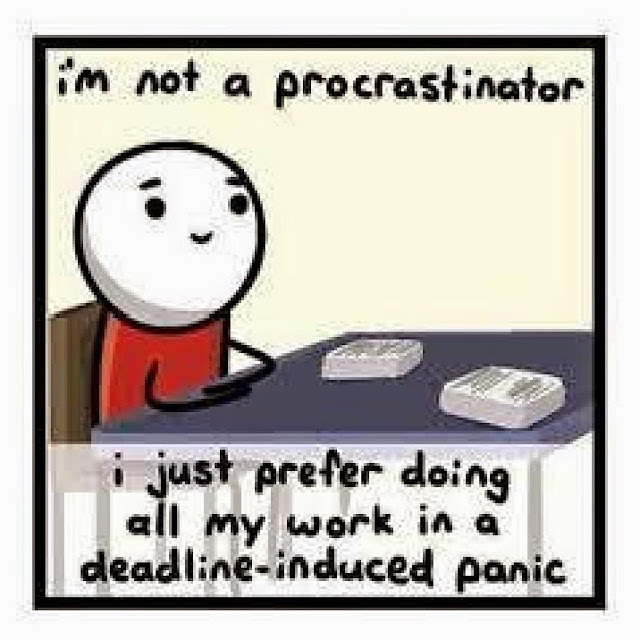 I don't know whether to hope that I am not in the minority with my last minute rush, or that I am. I know I just work better under LOTS and LOTS of pressure. But I wanted to share one of those projects with you that I cam up with this week and quickly designed and sewed up for our Halloween party. It's a Jack O'Lantern Halloween pumpkin! It's perfect for sitting on your party table and offering your guests their silverware or their napkins in a super cute way. You can sew it with the inside dividers to create a silverware holder, or leave them out to use this pumpkin as a napkin holder. The choice is up to you on how you sew it! If you are familiar with plastic canvas this is a quick sew and can be done in a matter of hours. If not, then it might take a little longer if you desire the inside dividers in your silverware holder. 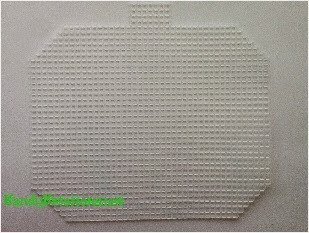 Start by cutting out your plastic canvas shapes according to the pattern. 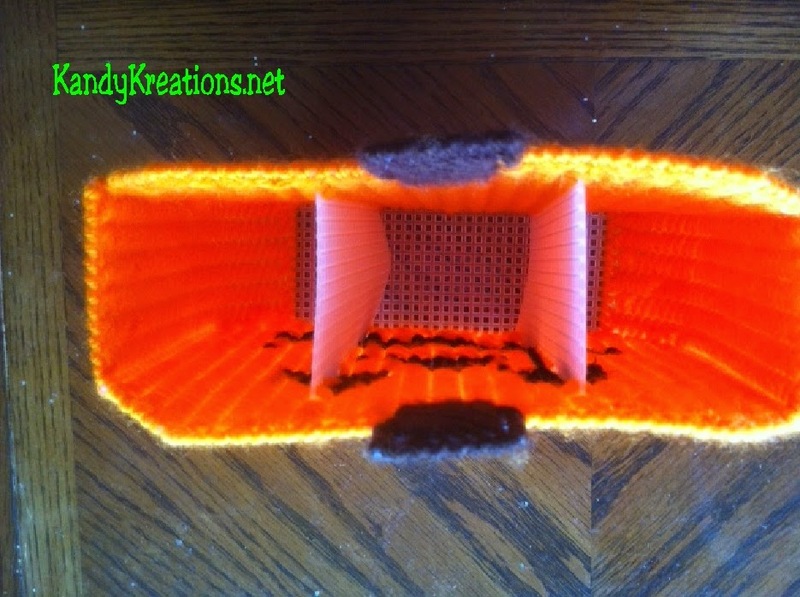 You'll need two pumpkin shapes, 2 sides, 2 inside dividers (if desired), and the bottom piece. You'll need two pieces of 7 count plastic canvas to do this. 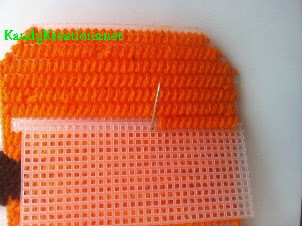 Sew each of the patterns using orange, brown, and black yarn according to directions. Leave the blank lines empty if you desire to have the inside dividers on your silverware holder. 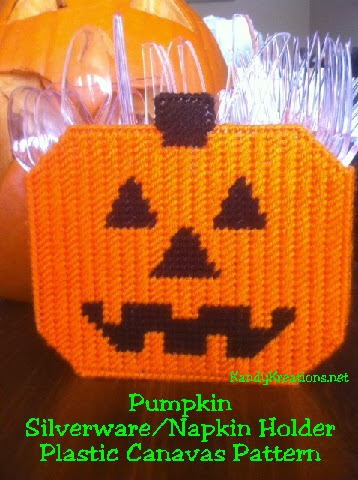 If you'd rather use the pumpkin as a napkin holder, you can sew the entire front and back using the continuous pattern design. 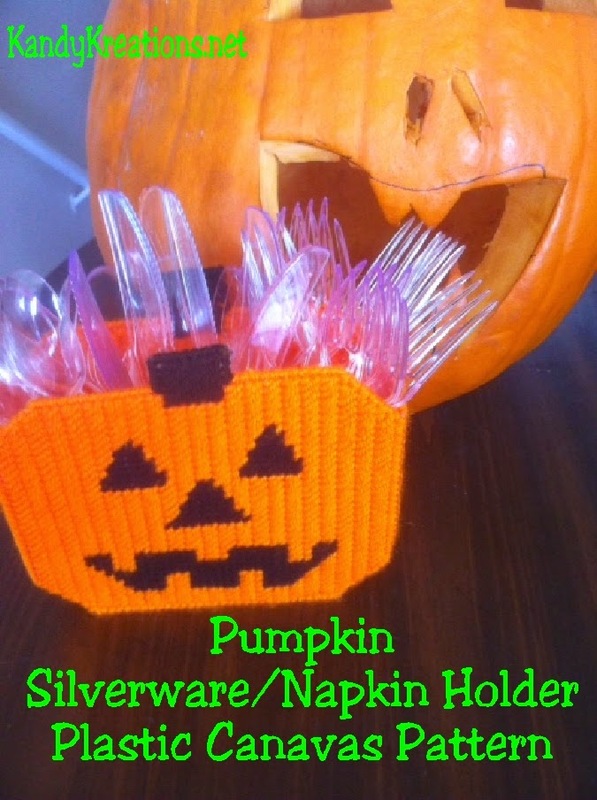 If you want to make the pumpkin into a silverware holder, take one of the divider pieces and lay on the back side of the front of the pumpkin. 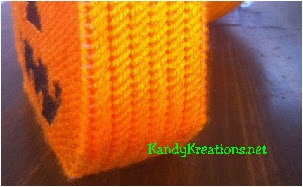 Line up the blank edge in the pumpkin pattern and the long side edge of the inside divider piece. I found it was easier to lay this so it folded toward the center of the pumpkin. Complete pattern making sure to catch the edge of the inside divider piece in the back of the orange goblin stitch and black continental stitch. Repeat on the back side of the pumpkin, creating the dividers between the front and back of the pumpkins. Finish off the pumpkin by joining the sides and bottom using an overcast stitch in orange to the front and back of the pumpkin to create a container for your silverware or napkins. Add your party necessities to the pumpkin and use on your Halloween table to make your guests smile. You can even turn him around for Thanksgiving and use him on your table there too! Talk about killing two "tables" with one pumpkin. 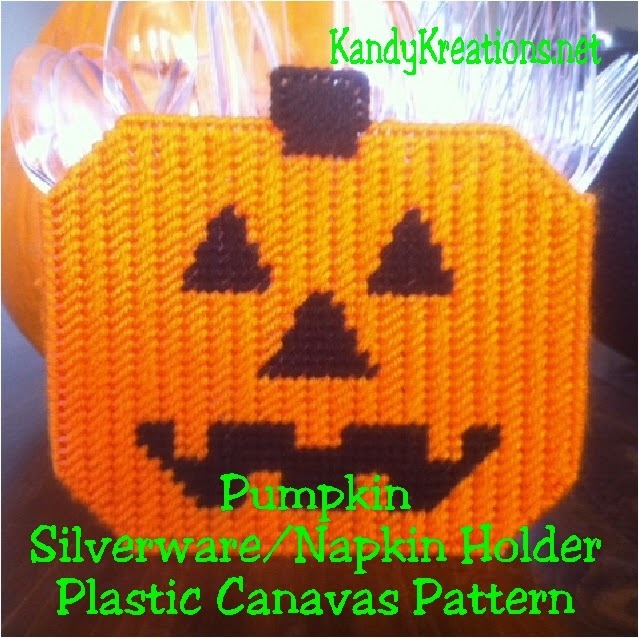 You can go and grab the free plastic canvas pattern for this Halloween Pumpkin silverware holder here.